A police cruiser is shown at the scene of a shooting investigation near Islington Avenue and Poplar Heights Drive on Saturday night. 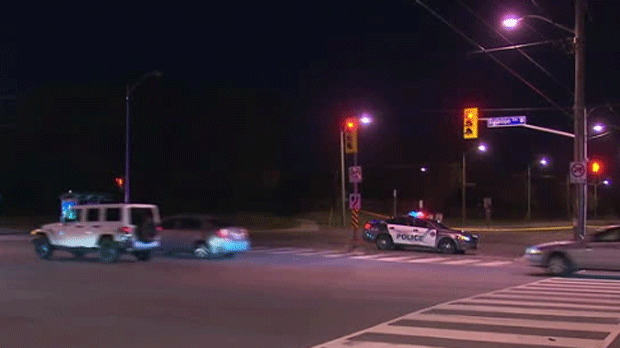 A male teenager showed up in hospital with gunshot wounds after a reported shooting in Etobicoke early Saturday evening. Police say that witnesses reported seeing two vehicles travelling at a high rate of speed near Islington Avenue and Poplar Heights Drive at around 7:15 p.m. when a passenger in one of those vehicles began firing at the other vehicle. Both vehicles reportedly fled the scene after the shooting but police say that a male with gunshot wounds later showed up at a local hospital in a vehicle with visible bullet holes. Police say that the victim, believed to be about 17 years old, was subsequently rushed to another hospital via emergency run, where he underwent surgery.